How to shoot slow motion? I came across this question quite often: how to shoot slow motion? First of all: There is no such feature as slow motion recording or slow motion mode. Slow motion is a film style which is achieved when each film frame is captured at a rate much faster than it will be played back. Frame rate, also known as frame frequency, is the frequency (rate) at which an imaging device displays consecutive images called frames. The term applies equally to film and video cameras, computer graphics, and motion capture systems. Frame rate is expressed in frames per second (FPS). 24p – Was adopted by those who planned to transfer their video signal to actual film. Many video makers still use this frame rate even tough they don’t plan to convert to film, but give it a “film look” due to the lower frame rate. 25p – This frame rate derives from the PAL television standard, common in Europe, Australia & in parts of Asia, Africa & South America. To be precise 25p and 30p are progressive formats which mimic a film camera’s frame-by-frame image capture whereas the interlaced signal contains two fields of a video frame captured at two different times. PAL and NTCS were actually interlaced broadcast signals, but I don’t want to go too deep into that matter. Slow motion (commonly abbreviated as slowmo) is an effect in film-making whereby time appears to be slowed down. Therefore to achieve this effect you have to record a higher frame rate and play it in a lower frame rate. E.g. when you record a video at 60 fps – there are 60 images taken in 1 second. If you play the video at 30 fps you play just 30 images (half of it) in one second. So time seems to be slowed down 50%. As you recorded 60 frames the clip time will be 50% longer and is now 2 seconds when changed. The human visual system can process 10 to 12 separate images per second and perceive them individually. Sequences at higher rates are perceived as motion. This type of slow motion is achieved in post production. 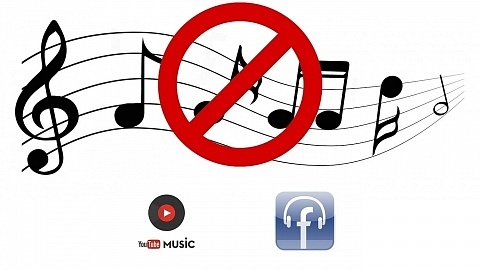 Instead of playing the recorded frames at a lower rate, additional frames are created in between. The software is checking the image before and after that frame, which has to be created, and is rendering a new image on this bases. The quality of the result is of course based on the performance of the software. 2. How to do Slow Motion Videos? GoPro Studio is a free software your can download from GoPro’s website. You can also import footage from other cameras, the video in the example below was taken with the Xiaomi Yi e.g. First you have to import the video “Import new files” on the left. I loaded a clip with was recorded with 50fps and is 28:44 (=28 sec. and 44 frames) long (arrow left). Then click on “advanced settings” and a new window pops up. There you can change the frame rate. I selected 25fps – half of the original clip (arrow middle). Then click “add clip to conversion list” and it will show up in the list on the right side of the screen. As you can see the frame rate has now changed to 25fps as selected (arrow right). When you take a look at the time next to it, you will notice that the clip is now twice as long as the original clip. 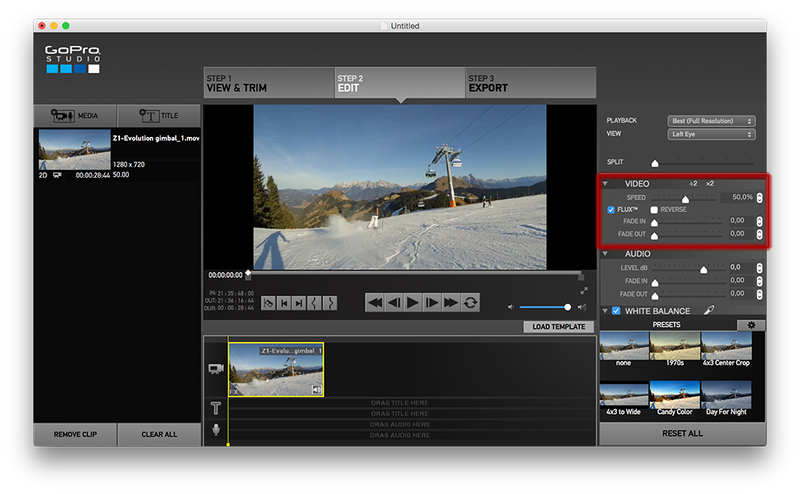 In Step 2 you can edit your converted clips, add audio, insert text, add effects,… As you can see in the red box there is also a Speed Level. You don’t have to select a slower speed here, as you already converted your 50 fps footage to 25 fps. You can leave the speed controls at 100%. In this example I changed it to 50% and the checkbook “Flux” appeared. That enables Time Stretching – the method I described earlier. GoPro Studio is now creating new images in between the ones recorded, to stretch time and create the slow motion effect. If I now select 50% as shown, the final clip will get additionally 50% slower. 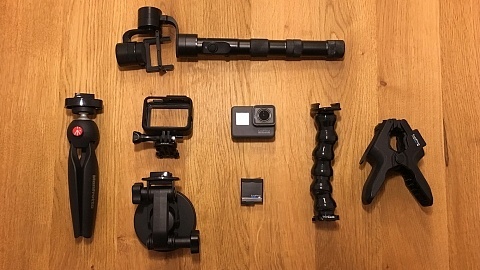 You can play around and see how good the results will be based on your recorded footage. 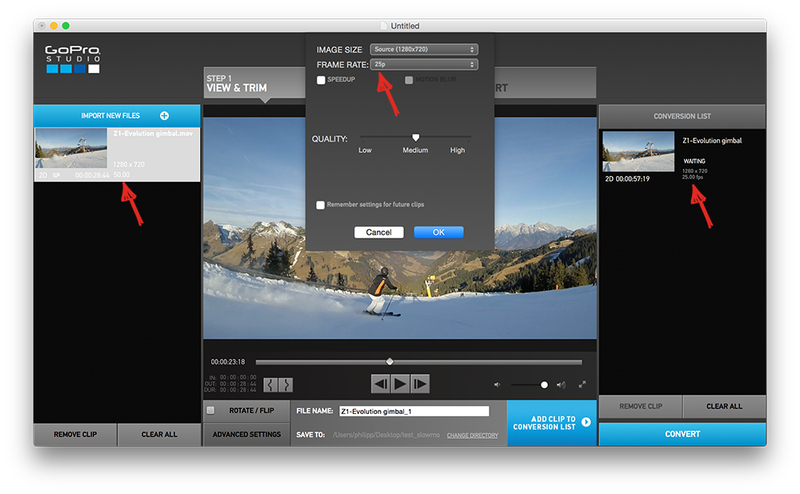 When clicking on “Step 3 Export” a new window pops up where you can select where the video is saved. If you have chosen the Flux option, you’ll have to check it here as well so the clips, where this option was added, will be rendered accordingly. That’s it and you have created your Slow Motion Video. I hope you like this tutorial, if I should add other Software Options let me know in the comments. Subscribe to my Newsletter if you want to be informed when new tutorials are released on my blog and share it on Facebook if you found it useful. 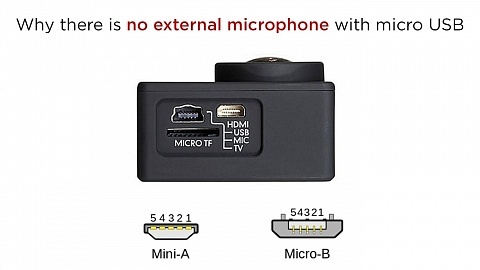 Why do action cameras with micro USB port not allow the use of an external microphone?